Abhishek is an Indian playwright and director who grew up in Delhi and now lives in Bangalore. He writes in English, Hindustani (Hindi/Urdu) and Bangla. He is the artistic director of the Indian Ensemble and a winner of the Metro Plus Playwriting award for his play Harlesden High Street which was produced by Tara earlier this year. His other work includes Rizwaan (Urdu/ English), Lucknow, An Arrangement of Shoes and Afterlife of Birds. His play, Gasha (Hindi/ Urdu/ Kashmiri) won the best play award at the Mahindra Excellence in Theatre Awards, New Delhi. He studied theatre at LISPA (London International School of Performance Arts) and attended the Royal Court International Residency in 2011 to continue his work on The Djinns Of Eidgah which was produced at the Writers Bloc Festival and in other parts of India in 2012. He is currently under commission by the Royal Court for his play, Phala about contemporary Tibet and the future of non violence. 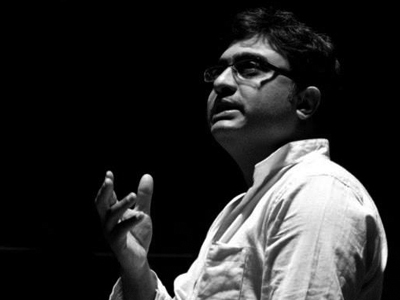 Abhishek is a Visiting Professor at Abhu Dhabi and New York Universities and his award winning work has toured India and Internationally, and in 2018 his work will be at The National Theatre.